sumptuously rich, elaborate, or luxurious: a lavish banquet. • (of a person) very generous or extravagant: he was lavish with his hospitality. • spent or given in profusion: lavish praise. bestow something in generous or extravagant quantities upon: the media couldn't lavish enough praise on the film. • ( lavish something with) cover something thickly or liberally with: she lavished our son with kisses. So, on our way back from Disneyland we stopped at the Camarillo outlets. We parked, got out of the car, and Nate said, "Oh, look. There's the Coach outlet." It was right next to the Nike outlet where we were headed, and he suggested we pop our heads in there first. I was thinking I would drool a bit and then we'd move on. I mean, it's Coach. The bags are gorgeous... and a fortune. Not like I would ever actually OWN one, unless I found it at Goodwill. he told me to pick out two. "What?" I shrieked with an odd mixture of glee and uncertainty. Nate... MY husband Nate... told me to pick out TWO Coach bags. "Yeah. Why don't you pick out a smaller one and a larger one, that way you can switch when you don't have as much to carry." I. Could. Hardly. Breathe. "Well, you look around. I'm taking the kids to the Nike store to look at the baseball stuff. Call me if you need anything." And he did. He took all four kids over to the Nike store so I could be overwhelmed in peace. My thought process: "Oh! My! Gosh! What should I get? Should I be practical? Get something that goes with anything? Get something fun? Something traditional? What do I do? Solid? Pattern? Leather? Canvas? Eeeeeek! "No. I should just walk out. How silly of me to spend this much money on handbags when there are starving children in Africa, when there are orphans in the Ukraine." By this time I had at least four bags slung over my arm. The crowd was huge, and if you liked something you had to pick it up and carry it around until you decided, or else someone else would. I started to put the bags down. THEN it hit me like a ton of bricks. (I know it was actually the Holy Spirit, but sometimes He operates that way.) My husband was wanting to bless me with something he knew I would love, and I was about to reject it. He was saying, "Go ahead! Pick whatever you want. I love you. I care about your joy and I know this will mean something to you." He was showing me how much he loved me. He was lavishing his love on me. So, I picked out two Coach purses. I received my husband's lavish love, and am so thrilled that he would do something like this. Something that means absolutely nothing to him (Purses? Seriously?). And he has so enjoyed seeing ME enjoy HIS gift! How often do we reject God's gifts to us, just as I was about to reject Nate's? All too often, this is how we respond. We think we're unworthy, or that someone else is more deserving, or that we won't use the gift right, or that we'll mess something up... and we wind up rejecting what He's trying to lavish on us. Or sometimes we accept it, but reluctantly, as if He was wrong to give it in the first place. But He wants to lavish His love on us. He wants to enjoy US enjoying HIS gift. Because He loves us. Lavishly. My husband loves me. Lavishly. My God loves me. Lavishly. and this was a great perspective, I really appreciate what you say and how you say it! That just blesses my socks off too! Husbands ROCK! The bags, the love, the blog. And that hubby of yours. But don't tell him I said he was beautiful. I am SO VERY GLAD you didn't deny the blessings your husband wanted to give you. Your blog said it perfectly, I am exactly the same way except I am a Brighton lover and a purse lover as well but never dreamed of actually owning an expensive Brighton purse. Steve blessed me with the same gift "Choose whatever you want" and I tell you, I wrestled just as you did and finally chose the purse of my dreams and it truly is my favorite purse ever! Love your choices too my friend. Oh Angela I know EX.ACTLLY the feeling you were describing! I have been in that spot many times, and because I have been there so many times I have brought my shopping down a big notch. Huge notch. I know that feeling of wanting to splurge on yourself but then you feel guilty. My thoughts do go to the starving children in other countries and to the homeless living in my town. The worst is leaving a mall with lots of bags and on your way out you see a homeless vet asking for money. That right there kill me! I do have my charities I give to and I do help others but still I feel that struggle sometimes. But I have become a better stewart of my money so now when I do go out shopping now for me I now guilt free and I make wiser decisions. Oh and by the way I did it too!! I have a big girl blog! I'm new at this so bear with it, I'm still trying to figure out so many things. Oh, I just LOVE this post!! Thank you so much for the reminder to allow my hubby to lavish his love on me! Hurray for wonderful husbands! I love this post of yours because I think it really sums up what alot of Christian women go through all the time. What a great real life illustration! And it helped me in my own life. We are going on a missions trip at the end of April and the cheapest fare just happened to be through Copenhagen...a place my husband and I have wanted to visit for years! So we have a few days there and I have had this tempered sort of excitment because I am super excited to see the city but, you know, we are supposed to be suffering for God and all and so I feel a little guilty:) You have just reminded me that we have just been lavished on by God! I can now enjoy it fully...and even revel in His love!!!! Thanks for the reminder! Beautiful post and beautiful bags!!! Those were great choices! I especially like the first bag. 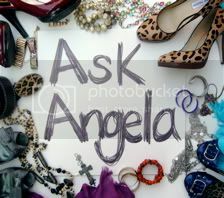 Thank you angela...Really thank you. I need to see things that way. Bethany had me read this because I have been struggling with quite an expensive gift my husband lavished upon me. But, I can see that you are totally right. This is a great little post. & I love your choices!